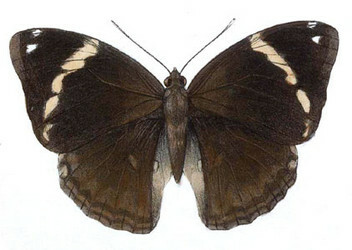 A neotropical genus of medium-sized brassolines. Specimens are attracted to rotting fruit, and may also be encountered perching on tree trunks. "Hemming  was not aware that there was an earlier designation of a type-species for Pavonia Godart. Lucas (1847, in D'Orbigny, Dict. univ. Hist. nat. 9: 515) validly designated Papilio cassiae Linnaeus, 1758 as its type-species. Anthomantes Gistel, 1848 is a replacement name for Pavonia Godart, 1824, which is a junior homonym; thus, Anthomantes also has as type-species Papilio cassiae Linnaeus, 1758. Note that Anthomantes Gistel, 1848 is available and a senior subjective synonym of Opsiphanes Doubleday, 1849, but as it has not been used as valid after 1899, then it should be treated as a nomen oblitum, and Opsiphanes as a nomen protectum." Page: Tree of Life Opsiphanes Doubleday 1849. Authored by Andrew V. Z. Brower. The TEXT of this page is licensed under the Creative Commons Attribution License - Version 3.0. Note that images and other media featured on this page are each governed by their own license, and they may or may not be available for reuse. Click on an image or a media link to access the media data window, which provides the relevant licensing information. For the general terms and conditions of ToL material reuse and redistribution, please see the Tree of Life Copyright Policies.